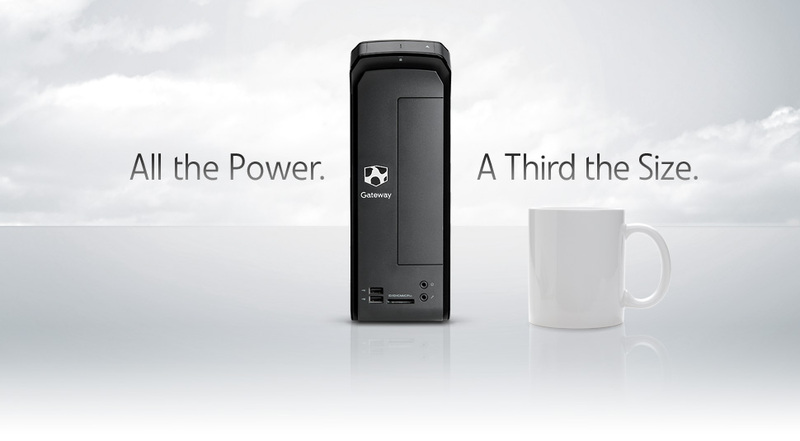 At a third the size of most other desktops, the Gateway® SX Series Desktop is so compact its modest appearance may fool you. But factor in up to 8-core processing power and high-end graphics capabilities, and it’s easy to see that the SX’s stature is only a spoonful of its appeal. Soft curves and a matte black finish convey a sense of quiet and elegance. Glossy trim and chrome logo badging add a tasteful touch to a small chassis that addresses a practical need for space. Advanced 4-core processors will make your SX hum, while you can select from a wide range of high-performance graphics cards to supercharge your games, movies and more. With your SX, every high-definition movie plays like a big-budget blockbuster. Immerse yourself in HD with optional Blu-ray™ and HDMI™ output, and experience cinematic magic like never before. Front-panel access makes it all easy for you! Commonly used USB ports, audio jacks and the digital media card reader are located along the top front edge of the PC, right in front of the user.